England face Wales in this absolutely massive game, which is almost a must win for an England side still reeling after a disappointing 1-1 draw against Russia in the first round of Group B matches. It is arguably the biggest home nation’s clash in living memory, with a win for either side at the Stade Felix Bollart-Delelis in Lens virtually guaranteeing qualification to the last 16. Roy Hodgson’s England team can feel unlucky to have not come away with all three points in their opening game, but the pressure will be firmly on in Lens as anything but a win will leave England on the precipice of elimination. England looked sharper and had fluidity to their play which on other days would have justified a comprehensive victory against Russia last Saturday. Wayne Rooney had one of his most productive performances in an England shirt at a major international football tournament in years. Adam Lallana displayed a tenacity and flair which stood out all game. There were concerns too, with the Spurs duo, Harry Kane and Dele Alli looking flat and lacking their usual energy. Raheem Sterling will be lucky to retain his place in the starting eleven, unable to penetrate or impact the match against Russia in any positive way. In all, there were many positives to take from the match for England, none more than the fact that England’s starting 11 vs Russia, was the second youngest average age (25 years and 293 days) at a major international football tournament. I would love to see Roy go really bold against Wales and play Kane, Rooney and Vardy, but I have a depressing feeling his more likely to bring in James Milner for Sterling. 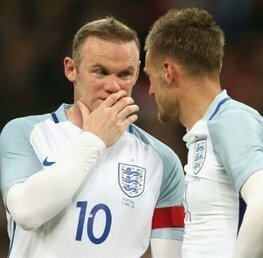 The England team has to grasp the nettle and aim to win the match against Wales, rather than simply not lose. The late substitutions by England in the match against Russia changed the momentum and allowed Russia to grab a late equaliser. It will be fascinating to see whether England can build on the first game and approach the Wales game with as much positivity, or revert back to a familiar limp tournament display we have become so accustomed to over the last decade. Wales by contrast displayed an assured averageness during their first group game victory against Slovakia, that many would typically associate with one of the European major footballing nations. Wales certainly weren’t spectacular in beating Slovakia 2-1 in Bordeaux, but they showed resilience and a genuine team ethic which England arguably lack. Wales will also be playing with a freedom that will allow Wales to sit and counter attack against an England team that needs a win more than Wales. It’s easy to just pick out Gareth Bale, but Wales had a number of strong performances in the win over Slovakia including Ben Davies, Jonny Williams, Joe Allen and Hal Robson-Kanu. After waiting 58 years since last appearing at a major international football tournament, Wales seemed at complete ease on this stage becoming the first British team to win their opening game at an European Championship finals. Team Gareth Bale (sorry Wales), will naturally be relying on their world class superstar Gareth Bale to do the business against England, and is without question the one truly world class player on show in Lens on Thursday. Gareth Bale riled England on Tuesday by claiming no England players would get into the Wales team, which is the latest Bale jibe against England after claiming Wales are more patriotic than England earlier. I can see Bale getting joy against Smalling and Cahill, so it wouldn’t surprise me if we saw Bale playing in a more advanced role leading the line. Wales have conceded in all of their last five games. England have only lost two games since World Cup 2014. 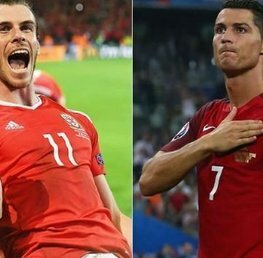 This is the first time England and Wales have faced each other in the finals of a major football tournament. England last played at the Stade Bollaert-Delelis in Lens during the 1998 World Cup, beating Colombia 2-0. Wales haven’t scored in their last four matches against England. England have failed to score more than one goal in 13 of their last 14 matches at a major tournament (World Cup and European Championships). England managed nine shots against Russia in the first half, their most at European Championship final opening half since Euro 2004 (11 vs Croatia). Gareth Bale has scored 14 of the 31 (45%) Wales goals since Chris Coleman took charge of his first game in February 2012. England have no option but to go for the win in this match. And while I am still wiping the egg off my face from my England vs Russia predictions I have renewed confidence that England will produce the goods in this game. England have attacking options and appear much more balanced than in recent years. According to England legend, Peter Shilton, England should beat Wales 9 times out of 10 so perhaps taking the odds of 3/5 (at Stan James) on the England win represents great value! While Wales have the best player, in Gareth Bale, I believe England will have too much quality over 90 minutes and should win. I fancy the game to be a lively affair and can see bookings and corners being a good way to play things. England/England – Half Time/Full Time (best priced at odds of 29/20 with Coral). Bet now with Coral! England to win and both teams to score (best priced at odds of 3/1 with Betfairsportsbook). Bet now with Betfairsportsbook! Over 11.5 corners (best priced at odds of 28/17 with Unibet). Bet now with Unibet! Bet365 are generously offering another risk free £50 in-play bet. 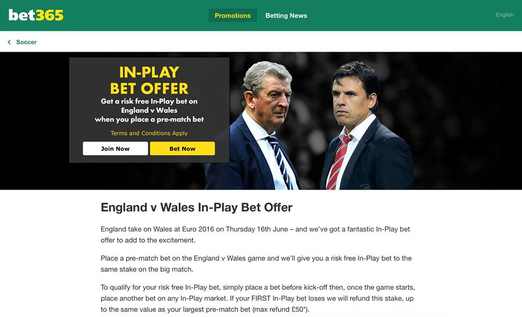 In order to claim this offer, you must place a pre-match bet on England vs Wales, following which bet365 will give you a completely risk free In-play bet to the equivalent stake on that game. 1) Place a bet BEFORE the England vs Wales game kicks off with bet365 here! 2) Once the GAME STARTS then place a bet on any In-play betting market (on the England vs Wales match) with bet365. Bet365 will refund you (max refund of £50) if your FIRST in-play bet loses, to the same stake value as your pre match bet. It’s as simple that! To claim this £50 risk free in-play offer visit bet365 here. For those of you who haven’t joined bet365, what are you waiting for?